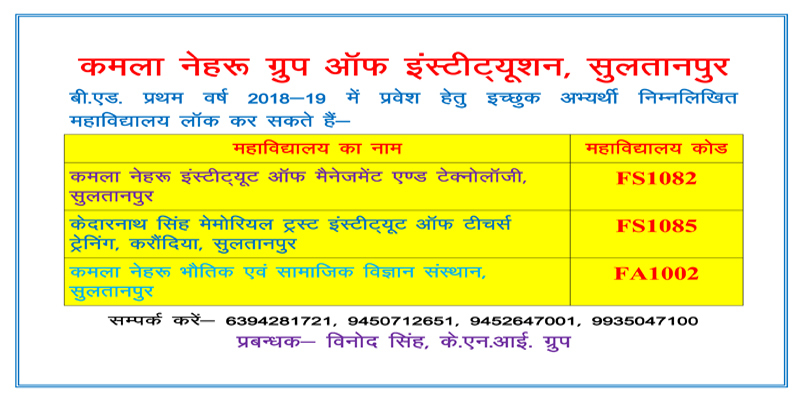 Admission throught UPSEE seats (85% seats) from counseling of UPSEE. Management seats (15% seats). College has conducted every year entrance exam in the month of May-June and on the basis of merit, candidates will be selected for admission. Institute has conducted every year entrance exam in the month of May-June and on the basis of merit, candidates will be selected for admission. For admission to B. Tech IInd Year the candidates who have passed three-year Diploma (with minimum Gen/OBC - 50% (PCM), SC/ST - 45% (PCM)) from institutions recognized by the U.P. Board of Technical Education in Engineering are only eligible for admission. The candidates who have passed two-year Diploma (with minimum 60% marks) from institutions recognized by the U.P. Board of Technical Education in Pharmacy are only eligible for admission. The candidate must pass 10+2 in any discipline. from any recognized board/university. The minimum qualification required is 50% marks in 3 years bachelor’s degree in any discipline. In case a candidate has not qualified CAT/CMAT, he would need to appear in SRGI-MAT exam, followed by group discussion and personal interview. The candidates must have minimum of 50% marks (Gen/OBC) & 45% marks (SC/ST) in (10+2) from any recognized Board/University with Physics, Chemistry, Mathematics / Biology as compulsory subjects. The candidate must pass 10+2/Graduation from any recognized board/university and must have respective subject at 10+2 leve/Gradution l for which he/she apply for admission.